Singer Oxfordshire, Oxfordshire, Oxford, Banbury, Bicester, Abingdon and other areas of the UK. Louise makes frequent visits to Oxfordshire as a singer and has visited many of its wonderful venues. Oxfordshire is very popular for weddings as well as many other types of events. I suppose two reasons for its popularity are its close proximity to London and it’s accessibility by rail. The venues range from colleges such as Pembroke College and Magdalen College in Oxford to luxury hotels such as Whately Hall Hotel in Banbury, Bicester Hotel Golf & Spa and Upper Reaches Hotel in Abingdon. As a performer Louise has explored many of the venues in Oxford, Banbury, Witney, Bicester, Henley on Thames, Carterton, Thame as well as many other villages and towns. Louise’s popularity as a singer is based on her ability to adapt to a situation and provide music that just seems right for the occasion. Crossing the borders of jazz, rock, pop, latin Louise and other genres, Louise manages to perform every song with conviction. Luoise is influenced by such great singers such as Judy Garland, Ella Fitzgerald and Nina Simone. Her style is reminiscent of the jazz greats, but still remains unique. Louise is always willing to learn any request that you may have and you can rest assured that her performance of that song will be beyond your expectations. Most of the time Louise performs with Eugene Portman as a duo, but further to that Louise can offer larger line ups including a trio, quartet and a five piece jazz band. The largest line-up consists of vocals, piano, bass, drums and sax. Louise uses musicians of the highest calibre – musicians that can be relied upon to turn up on time, look smart and perform to an exceptional standard. 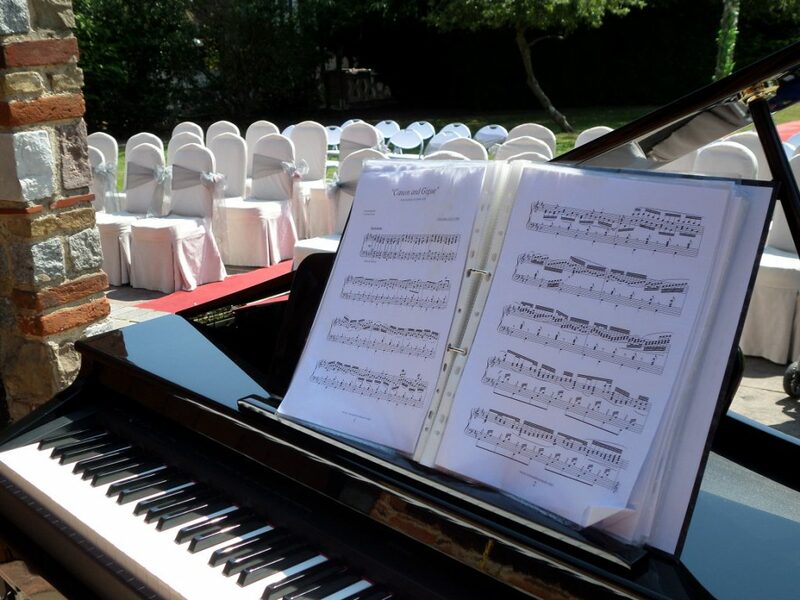 The line-ups can be mix and matched so you can have a solo pianist for part of your event followed by a five piece jazz band for another, Please contact Louise to discuss your reqirements – anything is posssible. Louise’s pianist can provide a digital piano at no extra charge for those occasions when the venue don’t have a suitable instrument of their own. In addition to to this a Baby Grand Piano Shell can be provided for those occasions where a normal digital piano just wouldn’t look quite right. It consists of a shell in a baby grand piano shape and houses a normal digital piano. The result is something that looks like a conventional accoustic instrument and yet it can give a sound that is impossible to ditingish from the real thing. Please see the Baby Grand Piano Page for more details.